McKinney Falls State Park, Texas. From Austin, take U.S. 183 south 13 miles to McKinney Falls Parkway. Just ten short minutes from downtown Austin. Often overlooked since it is so close to Austin, McKinney Falls is perfect for an afternoon picnic or a quick trip to get away for the day. McKinney Falls State Park is in the center of an early Texas land grant that originally fell within the impresario contract of a Texan hero, Ben Milan. Ten acres of the land were transferred to Santiago Del Valle who at that time was Secretary of the Mexican government, and who had previously served in the Mexican Congress. In 1835, Del Valle sold a portion of his land to Michael Menard who helped found the town of Galveston. Thomas F. McKinney was one of his business associates and bought the Del Valle grant in 1839. His family occupied the land but sold almost all of it off by the time of his death in 1873. Some of the land remained agricultural and became the City of Del Valle, the north tract became urbanized, and the remainder is preserved in the park. McKinney was also one of Austin's first 300 colonists. He settled on Onion Creek and became a breeder of racehorses. You can still see the remains of the trainer's cabin in the park. The cabin was built in the early 1850s and served as quarters for John Van Hagen, McKinney's thoroughbred horse trainer, until Hagen moved to New York in 1873. There were nearby exercise and training areas. McKinney also owned a steamboat that he used to take to Mexico to trade horses. McKinney Falls is at the confluence of Onion and Williamson creeks. The water changes from calm and quiet to rapids and falls depending on rainfall. 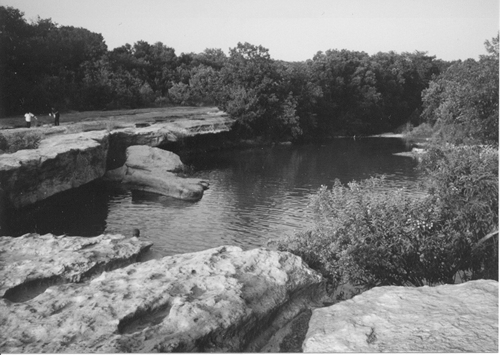 The swimming hole is similar to Hamilton Pool with a large circular pool underneath a rock overhang. The swimming hole is also closed occasionally due to pollution. In addition to swimming, 640-acre McKinney Falls State Park has several trails for hiking and bicycling. The 3.7-mile Onion Creek Trail is paved for hikers and bicyclists. Swimming is allowed in Onion Creek but is at your own risk. The three-mile Homestead Trail is unpaved and is designed for mountain biking and rough hiking. There are shorter interpretive trails, such as the Smith Rockshelter Trail that leads to an Indian rock shelter. A 3.5-mile paved trail runs along Onion Creek and passes the upper falls. Another 3.75-mile interpretive trail begins near the visitors' center and runs under huge limestone bluffs. Yet another trail is unmarked and crosses the main falls. It also passes the historical McKinney homestead and flour mill from the 1820s and then goes on about a mile through cedar and mesquite. McKinney Falls State Park has camping, picnicking, and a variety of terrain and wildlife, including half-brown, half-black rock squirrels. Pets on leash are permitted. Wheelchair-accessible.